Alter The Press! : The Summer Set Crash Bowling For Soup's Set at Warped Tour; Cover "Girl All The Bad Guys Want"
The Summer Set Crash Bowling For Soup's Set at Warped Tour; Cover "Girl All The Bad Guys Want"
The Summer Set crashed Bowling For Soup's set yesterday (July 19th) at the Chicago stop of the 2014 Vans Warped Tour. The pop/rock quartet took to the stage during their set and covered the band's 2002 hit single, "Girl All The Bad Guys Want," while they sat down and watched, while partaking in a couple of beers! 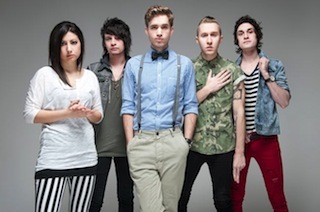 You can watch a fan-shot recording of The Summer Set's performance below. Remaining dates and ticket information for the 2014 Vans Warped Tour can be found here.